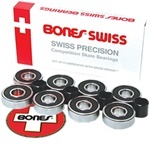 Bones Swiss skateboard bearings in 8 pack. Regular 608 bearings. 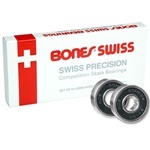 Legendary Bones Swiss bearings have been the industry standard ever since they were introduced in 1983. Fast, smooth, and long lasting, these bearings have become the choice of most professional skaters, and remain unequaled in their class. Bones Swiss feature the same ultra high performance components used in Bones Swiss Ceramics, except that the balls are chromium steel instead of silicone nitride. Bones Swiss have earned their fame through years of proven, dependable performance for the best skaters in the world. No hype, just the best... ask anyone who has been skating for a few years. - High speed Nylon? ball retainer provides added strength and speed. - Skate Rated? clearances, tolerances, materials and lubricant provide the best performance and durability possible.